At its October meeting, the Financial Action Task Force—an intergovernmental body that promotes international anti-money laundering and counter-terrorism financing standards—decided that it will not call on its members to apply countermeasures against Iran. (In the world of such intergovernmental bodies, the word “countermeasures” has a very specific meaning: taking action to block Iran. Meanwhile, “measures” merely refers to enhanced scrutiny.) But the organization did say that countries should tightly watch over Iranian transactions even if not going so far as to terminate certain types of banking networks with Iran. Why is this distinction important? Because in essence, the organization’s decision gives Iran an additional four months to enact anti-money laundering reforms that are in line with international standards—and gives the European Union that much more political wiggle room in its effort to try to salvage the nuclear deal with Iran. The tortured history of anti-money laundering reforms in Iran. Such reforms are crucial if Iran is to get relief from sanctions. Although enacting new, anti-money laundering legislation is not a condition of the Joint Comprehensive Plan of Action—the agreement between Iran and the P5+1 (the United States, United Kingdom, France, Russia, China, and Germany) that curbed Iran’s nuclear program in exchange for sanctions relief—doing so is necessary for Iran to reintegrate into the global financial system. Foreign investment in Iran, for example, would be stymied if banks perceived the country’s financial system to be high-risk. This is why the Financial Action Task Force’s original decision, back in June 2016, to suspend countermeasures against Iran was so consequential: The decision provided the political space necessary for Iran to begin implementing new anti-money laundering rules and regulations. At least, that was the plan. That plan changed in May this year, when the Trump administration decided to unilaterally withdraw from the Iran deal and reimpose US financial and economic sanctions. The US Treasury Department gave companies two separate 90-day and 180-day deadlines to end ties with Iran, otherwise known as “wind-down periods.” This week marks the end of the final wind-down period, whereby the United States reimposes sanctions on Iran’s financial, energy, shipping, and insurance sectors. Remarks by US Treasury Secretary Mnuchin suggest that the United States is even prepared to sanction SWIFT—the Belgium-based financial messaging service that handles the bulk of global transactions—if the company does not disconnect Iranian banks from its services. A move like that would not only intensify the dour state of relations with the European Union, but potentially invite significant blow-back against US banks. In June 2016, Iran committed to implementing an action plan addressing its money-laundering and counter-terrorist financing deficiencies. Although Iran has since moved several reform efforts forward, they still fall short of international standards. Specifically, the Financial Action Task Force noted that Iran had failed to adequately address nine out of ten commitments from the country’s action plan. For example, Iran’s counter-terrorist financing legislation includes exemptions for groups “attempting to end foreign occupation, colonialism, and racism”—a rather glaring loophole. Iran also still lacks appropriate mechanisms and authorities to identify and freeze terrorist-linked assets in line with relevant UN resolutions. And it lacks rules and regulations to ensure adequate customer due diligence requirements. These are just a few of the many places where Iran has failed to measure up to international standards in this area—in some cases, for as long as a decade. Since 2008 the country has made overtures to join the Financial Action Task Force, and promised to adopt a range of anti-money laundering and counter-terrorist financing reforms. But each year it has fallen short of making any meaningful progress. By February 2019, the Financial Action Task Force expects Iran to implement all of its commitments or else the task force will “take further steps to protect against the risks emanating from deficiencies in Iran’s AML/CFT regime.” Whether this means a recommendation that countries take countermeasures against Iran or perhaps another delay is entirely up to Iran. Is Iran getting a pass? Since May, EU leaders have been scrambling to keep the Iran nuclear deal intact. Leading proposals include establishing a “special purpose vehicle,” which would essentially act as an intermediary between EU businesses and Iran that would help transactions avoid US sanctions. In other words, this means the establishment of an alternative payment system that avoids the US financial system. Anticipating such a move, Secretary Mnuchin has already threatened to sanction the “special purpose vehicle” should EU companies use it to avoid US sanctions. For its part, in August, the European Council had tried to prepare for the effects of such a US move by updating its own “Blocking Statute,” which gives EU businesses a legal avenue to recoup damages from US secondary sanctions. But it would be difficult (if not impossible) for European leaders to continue trying to salvage the JCPOA while also telling its banks that they must employ countermeasures against Iranian transactions as a result of the Financial Action Task Force’s designation of Iran as a “high risk and non-cooperative” jurisdiction. Although it remains to be seen whether or not the Iran nuclear deal is salvageable, there are few incentives left for Iran to implement anti-money laundering reforms. For better or worse, the Financial Action Task Force and the future of the JCPOA have become politically intertwined as a consequence of US unilateral sanctions. On one hand, the task force has given EU leaders the political latitude to push back against US sanctions—at least for the next four months, during which the European Union will not require its banks to take active countermeasures against Iran. On the other hand, the decision sends the wrong signal to the international community—that international norms and standards are taking a backseat to geopolitics. YANGON — An assessment of Myanmar’s efforts to tackle money laundering and terrorist financing has found significant weaknesses, including a failure to recognise the “serious” money laundering risks that the country faces. The Asia/Pacific Group on Money Laundering released the Mutual Evaluation Report on October 22, three months after it was adopted at the APG annual meeting in July. The “poor results” on the evaluation mean Myanmar will automatically be reviewed by the International Co-operation Review Group of the Financial Action Task Force, and may be placed on a black or grey list following that review. Myanmar was removed from the FATF’s list of high-risk and monitored jurisdictions in 2016 following some limited reforms. The Mutual Evaluation Report found that despite Myanmar being exposed to “a large number of very significant” money laundering threats, the authorities did not demonstrate a “credible understanding” of the risks. Myanmar needed to make “major improvements” in a range of areas, including investigation and prosecution of money laundering and terrorist financing, and confiscation of the proceeds of crime. Money laundering investigations are “not prioritised” and typically occur only after the successful prosecution of a related offence, such as drug trafficking, in order to identify and confiscate assets, the report said. As a result, only a tiny proportion of overall proceeds of crime are confiscated, and investigations are not pursued beyond Myanmar’s borders. Myanmar was also taken to task for its failure to pursue international cooperation, particularly in regard to money laundering, but the country fared somewhat better in regard to tackling terrorist financing. The evaluation was based on information provided by Myanmar and gathered by an evaluation team during a visit to Myanmar in late 2017. The APG is one of nine regional bodies that work with the FATF to combat money laundering, the financing of terrorism and the financing of the proliferation of weapons of mass destruction. Myanmar spent more than a decade on an FATF blacklist for non-cooperative states until 2016. In June of that year it was removed due to the “significant progress” it had made in establishing the legal and regulatory framework to meet commitments regarding the strategic deficiencies identified by the FATF in February 2010, the organisation said. The decision to remove Myanmar followed a brief field visit, the Myanmar Times reported at the time, but the Mutual Evaluation Report is a more rigorous assessment of whether the country is tackling money laundering and terrorist financing. By Myanmar’s own estimate, proceeds of crime are likely to total around US$15 billion a year, or around 24 percent of GDP. A national risk assessment drafted with International Monetary Fund support as part of the mutual evaluation process estimated that 63 percent of this figure was derived from tax and excise evasion, environmental crime, and corruption and bribery. Almost 50 percent of proceeds were generated by activities carried out by transnational crime groups and another 35 percent by domestic organized crime, the assessment estimated. Between 30 and 40 percent of the proceeds of crime is believed to flow out of Myanmar each year, with China and Thailand thought to be the main destinations. The national risk assessment acknowledged that law enforcement agencies were “not very effective” at conducting money laundering investigations, and were hampered not only by a lack of resources and training, but also a perception that officers could be bribed. The Mutual Evaluation Report said Myanmar’s risk assessment appeared to “under-rate the significance of drug production and trafficking, as well as the role of corruption in predicate crimes and money laundering”. There was also no analysis of how proceeds of crime are laundered within Myanmar, it noted. Of the 40 counter-measures against money laundering recommended by the Financial Action Task Force, Myanmar was deemed to be in compliance with only six, largely compliant with 10, partially compliant with 18 and non-compliant with six. It was evaluated as non-compliant on a recommendation concerning money and value transfer services, largely due to the lack of regulation in relation to the informal remittance network known as hundi. Similarly, Myanmar was deemed non-compliant on a recommendation concerning Designated Non-Financial Business or Professions, partly because of the operations of unlicensed casinos. Jurisdictions that are deemed to have achieved “poor results” on the evaluation by meeting at least one of four criteria – for example, being non-compliant or partially compliant on 20 or more of the 40 recommendations – are automatically referred to the ICRG for review. Myanmar met three of four criteria for review. If Myanmar is prioritised by the ICRG, it will have to agree on an action plan with the group requiring it to take actions to rectify deficiencies and report directly to the FATF on the progress made within a specified time frame. It may then be added to the FATF’s list of high-risk and other monitored jurisdictions, which presently includes only North Korea and Iran. However, the 2018 Mutual Evaluation Report still represented a significant improvement on Myanmar’s last evaluation in 2008, when it was compliant or largely compliant on only four recommendations. Among the steps that Myanmar has taken are the introduction of a revised money laundering offence in 2014 and a revised terrorist financing offence the following year. Organisational changes to a number of government bodies has led to “changes and some improvements”, the evaluation noted. However, the Mutual Evaluation Report said most of the reforms undertaken to address money laundering and terrorist financing risks appeared to be “ad hoc” and aimed at being removed from the FATF black list rather than addressing identified money laundering risks. WASHINGTON—Hezbollah, the Iran-backed Lebanese militia designated as a terror group by the U.S., is tapping a money-laundering ministate in Latin America that poses an escalating risk to U.S. national security, according to a report published Tuesday. The illicit activities in the so-called tri-border region linking Brazil, Argentina and Paraguay have long been a source of concern for U.S. security officials: After the Sept. 11, 2001, attacks, it became a surveillance target as a haven for terrorists in the Western Hemisphere. But now Venezuela’s political crisis and Argentina’s inflation, together with entrenched corruption and lax law enforcement, are helping fuel an illicit economy estimated to be worth $43 billion a year, far surpassing Paraguay’s entire gross domestic product, according to the report. The report was prepared by political risk consultancy Asymmetrica, funded and jointly published by the Washington-based nonprofit Counter Extremism Project. The ease of laundering ill-gotten proceeds and the economy of black market cigarettes, narco-trafficking, human trafficking and illegal arms sales have attracted criminal organizations from around the globe. “It has become an epicenter, or a shopping mall, of all the illicit goods and money you need to fund your operations,” said Stuart Page, one of the authors of the new report. After a free-trade zone was established in the region in 1970, regional drug cartels took advantage of corrupt government officials and weak border security to move their goods and launder cash around the region, say security experts. Over the years, the tri-border area effectively institutionalized corruption, those experts say. The money going to Hezbollah from the illegal Lebanese networks is of particular concern to U.S. authorities, especially as the Trump administration ramps up pressure on Iran and its proxies. The group is a political and military force in Lebanon, playing a major role in the Syrian civil war supporting President Bashar al-Assad alongside Russia and Iran. Argentina’s high inflation rate is helping drive illicit activities, the report’s authors said, as criminal networks sell their illegal goods and services for a higher value across their border. And as other countries such as Panama increasingly work with the U.S. to sever ties with Venezuela, the tri-border region has attracted illegal trade of goods, people and cash from Venezuela, whose government is accused by the U.S. of facilitating narco-trafficking. Vanessa Neumann, a co-author of the report, said the region is growing to be one the easiest hubs to launder funds in the world, a place where armored trucks trundle down the streets of Brazil’s Foz do Iguaçu and Paraguay’s Ciudad del Este carrying loads of cash, but where banks that offer credit are scarce. “It is well on its way to becoming an economically independent and fully criminalized substate,” said Ms. Neumann, a former member of the Organization for Economic Cooperation and Development’s Task Force on Countering Illicit Trade. Drug cartels from Bolivia, Colombia, Mexico and Brazil, as well as organized crime groups from China, in conjunction with a large Lebanese merchant community, all operate in the area. So do mafias from Korea, Hong Kong and Russia, said Asymmetrica, which led an observation team to the area for its research. Large numbers of Lebanese immigrants arrived in the region after the Arab-Israeli wars in the 1950s and again in the 1980s after the Lebanese Civil War. Even though only a small portion of the population is thought to be directly supporting Hezbollah, the criminal networks that have been uncovered over the years represent a significant risk to U.S. interests. According to Argentine prosecutors, Lebanese individuals in the tri-border region provided support for the bombings of the Israeli embassy and a Jewish cultural center in Buenos Aires in the 1990s that killed scores of people. More recently, many of the individuals sanctioned by the U.S. for financing Hezbollah from the region are still operating there, according to U.S.-based analysts and recent court cases. Earlier this year, the U.S. Department of Justice set up a task force of prosecutors with expertise in cases that involve drug trafficking, organized crime and money laundering to target Hezbollah’s financingoperations. Analysts expect the illicit operations out of the region to catch the task force’s attention. Federal governments in the region have acknowledged there is a problem but over the years have been unable to curb the illicit activities there. Paraguay’s government is now working with the Drug Enforcement Administration and Brazilian federal law enforcement to cut money laundering in the region. Likewise, Argentina’s new government agreed to host more DEA agents in the region. But the report’s authors said the extent of the problem requires a much more comprehensive solution, including stronger involvement of the standard-setting body, the Financial Action Task Force, and leveraging the power of the International Monetary Fund. The IMF, for example, could require Argentina to bolster its anti-money-laundering and anti-corruption oversight as fundamental conditions for the bailout loans Buenos Aires is seeking from the emergency lender. NEW YORK (Thomson Reuters Regulatory Intelligence) – Regulators are holding financial institutions responsible for the real-life consequences of anti-money laundering (AML) failures. Firms must reconfigure their transaction monitoring programs to identify the emergent, multi-dimensional money laundering and terrorism finance methods that are defeating today’s rules-based detection scenarios. Adopting an actor-centric hybrid threat finance (HTF) model can cut compliance costs, reduce risk, improve regulatory relations, and increase the usefulness of suspicious activity reports (SARs). Financial institutions are required by the Bank Secrecy Act (BSA) to detect and report customers engaged in money laundering, fraud, terrorist financing, and sanctions violations. With millions of customers, banks have fielded automated transaction monitoring systems, which use money laundering detection scenarios known as rules, to alert firms to certain customers for potential violations. Current industry detection logic has proven flawed and inefficient at identifying financial crime, resulting in record-breaking regulatory fines for financial institutions that fail to detect terrorists, drug cartels, and sanctioned state actors exploiting the U.S. financial system. Banks have spent billions on transaction monitoring systems that scrub their accounts for possible money laundering schemes. Detection rules are action-based and target suspicious transaction behaviors, such as excessive cash deposits, structured transactions intended to avoid government record-keeping thresholds, and rapid money movement through one bank to another. Customers who violate the detection rules trigger a system-generated alert, which is reviewed by an internal investigator. Despite decades and billions of dollars in industry investment, over 95 percent of system-generated alerts are closed as “false positives” in the first phase of review, with approximately 98 percent of alerts never culminating in a suspicious activity report (SAR). False positives cost the financial industry billions of dollars in wasted investigation time each year but more importantly, expose banks to steep fines and reputational damage for failing to identify bad actors involved in organized crime, sanctions evasion, or terrorism. Banks can reduce risk by reassessing their detection strategies, which presently lack the focus or sophistication to identify illicit source behavior. Unlike fraud, money laundering stems from a precursor criminal act, like extortion, misappropriation of funds, or trafficking. As such, most global money laundering is perpetrated by transnational criminal organizations (TCOs), rather than individuals. Bank accounts used to launder illicit proceeds may be set up for personal or business use, but are most often used to cleanse funds on behalf of a threat organization. As one might imagine, different threat groups launder money in different ways. For this reason, law enforcement agencies (unlike banks) target money laundering purpose; meaning they consider both source criminal behavior (e.g. drug trafficking) and illicit organizational membership. When a U.S. law enforcement investigation into a crime syndicate or terrorist group identifies suspect bank accounts, the Treasury Department’s Financial Crimes Enforcement Network (FinCEN) issues request for information notices (known as 314(a) forms) to those banks. The resulting case investigations often reveal that banks failed to detect or investigate these suspicious accounts, leading to increased regulatory scrutiny that opens the floodgates to fines and remediation. When bank AML programs neglect detection considerations for money laundering purpose and preceding illicit activities, they fail to identify bad actors exploiting the firm. Such failures have caused major institutions to incur hundreds of millions, or billions, in regulatory penalties and associated costs. Global and retail banks, money service businesses (MSB), digital currency exchanges, and casinos are all at risk of crushing enforcement actions. Financial institutions globally have been fined over $321 billion by regulators since 2008 (PDF)(here), with $42 billion in fines in 2016 alone. — Remediation costs over the first 18 months are typically 12 times greater than the fine itself. Firms incur not only financial loss, but also reputational harm. Regulatory enforcement actions often feature specific language indicating that banks aided and abetted terrorism, drug trafficking, and human trafficking by failing to detect and report illicit activity. Financial institutions have learned the hard way that regulators hold them responsible for the broader outcome of AML failures, not just their program’s procedures. Additionally, media outlets are quick to capitalize on negative news about large corporations, which can trigger a public relations disaster, especially when amplified by viral social media. When a regulatory fine is enforced upon a bank, it is often accompanied by a consent order requiring a forensic (lookback) examination of customer data to identify previously undetected risks and suspicious activity. This often results in tens of thousands (or more) of historical transaction-monitoring alerts that need to be reviewed in tandem with current alert output. As a result, many banks hire external consulting firms to address the alert backlog, which can end up costing many times more than the regulatory fine itself. Many of these same consulting firms market AML detection products and services that claim to reduce false positives and improve SAR filing percentages. For retail banks, these firms focus on tuning the very action-based rules that failed in the first place, without providing new scoring tables or custom data attributes to improve performance. In global correspondent banks, the detection rules are even less focused, due to limited information on external parties (i.e., non-customers) conducting global wire transfers. More expensive providers market high-tech applications, like unsupervised machine learning (UML) and artificial intelligence (AI) software, billed as a turnkey solution that updates scenarios based on quantitative abnormalities that lack common-sense detection logic. These applications are largely developed by technical specialists such as computer scientists who are unlikely to possess the requisite law enforcement, intelligence, and financial crime backgrounds to effectively target emergent risks. AML detection is a dynamic process that requires awareness and consideration of transnational security issues, public policy, and the regulatory climate – areas simply not being calculated into these AI scenarios. While UML/AI software improves efficiency in many business areas by instantly siphoning through vast quantities of structured and unstructured data, the complexities of money laundering tradecraft means there can be no magic bullet for solving detection challenges. Keep in mind: AML detection is already automated, just not predictive. Transnational criminal organizations employ professional money laundering cells that do not operate within the confines of expected, predefined, overly-broad transactional actions. Firms that continue to focus their detection strategies on UML/AI software and broad action-based targeting will fail to identify emergent threats and risk the ire of regulatory agencies. Criminal cartels, hostile states, and terrorist groups today form hybrid threat alliances that extend through their finances. In some cases, one single group may be classified as a hybrid threat organization. The Lebanese Shiite Islamic group Hezbollah is one such example. Designated by the U.S. State Department as a terrorist organization, Hezbollah is aligned with the Iranian Islamic Revolutionary Guard Corps (IRGC), Palestinian Hamas, Yemen’s Houthi rebels, and nearly one-hundred Shiite militant groups in Iraq, Syria, Afghanistan, and elswehere. These connected Shiite militant groups (Hamas is Sunni) collectively report to Iranian Supreme Leader Ali Khamenei. Iran is subject to a number of U.S. and international economic sanctions. Hezbollah has recently become a hot-ticket political issue for U.S. Attorney General Jeff Sessions, who in January 2018 announced the Hezbollah Financing and Narcoterrorism Team (HTNT)(here), an interagency team of prosecutors and investigators tasked with targeting Hezbollah’s criminal and money laundering networks. This announcement followed revelations outlined in a media report alleging the Obama administration derailed a Drug Enforcement Administration (DEA) program targeting Hezbollah’s trafficking operations(here), in order to secure the 2015 Iran nuclear deal(here). Sessions has indicated(here) that targeting Hezbollah’s money laundering operations will be a primary focus of the current administration; an emphasis set to extend to bank regulators. According to a December 2016 terrorism finance report (PDF)(here) by the U.S. House of Representatives Financial Services Committee, Hezbollah is a hybrid threat organization with a global footprint. With a structure that includes a Lebanese political party, conventional military, Iranian terrorist proxy force, and crime syndicate, Hezbollah is one of the world’s most unique and versatile threat groups. Hezbollah’s crime syndicate is extremely multi-faceted, with long-held narcotics, human trafficking, and counterfeit goods underworld networks throughout the tri-border Area of Latin America, the Middle East, North/West Africa, and Asia. Hezbollah maintains one of the most sophisticated and efficient trade-based money laundering (TBML) operations in the world, as evidenced by the 2012 Lebanese Canadian Bank laundering case (PDF)(bit.ly/2FCTV6h). Their TBML tradecraft is so proficient that they hide drugs and cleanse narcotics proceeds by owning all parts of an elaborate global distribution network that falsifies the number of shipments and amount of products shipped, while concurrently hiding counterfeit goods among legitimate products(here). This double-dipping smuggling and false invoicing operation provides the profit margin Hezbollah needs to purchase weapons, tactical kit, and to provide logistical support to their global insurgency operations in places like Iraq(here), Syria(here), and Yemen(here). Hezbollah’s business and money laundering tactics are extremely specific and unique (compared to other groups) and require seasoned intelligence practitioners to identify. They use virtually all banking products, including international wires, retail services, prepaid products, and money service businesses (MSBs) at different operational echelons, ranging from international/strategic to regional, domestic support companies (DSC), and at the tactical level. Accordingly, this one organization presents separate enforcement and reputational risks at different levels of operation. Like Hezbollah, other militant groups, drug trafficking organizations (DTOs), human trafficking outfits, and hostile nation-state actors are also competent money launderers. They too possess a hierarchical, multi-echelon global structure that utilizes numerous controls designed to subvert modern AML detection mechanisms. These groups hire professional money launderers with a detailed knowledge of compliance that could rival the AML experts working at banks. Professional money launderers working for global threat organizations launder funds in ways that superficially appear entirely legitimate, failing to raise red flags through conventional detection strategies. Put simply, these professional criminals are unlikely to make amateur mistakes, such as structuring or rapid withdrawal of cash. Detection logic focused on simple transactional behavior will never successfully identify money laundering operations by sophisticated hybrid threats like Hezbollah. Banks might think unsupervised machine learning (UML) and artificial intelligence (AI) software sounds new and exciting, but these programs detect anomalies and mistakes that professional money launderers are unlikely to make. The best way to address these challenges is with a detection platform based on the hybrid threat finance (HTF) concept derived from the U.S. Department of Defense “hybrid threat” doctrine. The military, intelligence, and law enforcement communities recognize the hybrid nature of international conflict relations, in that threat organizations across different classifications are deeply interconnected. HTF methodology targets the extension of those connections into financial markets, focusing detection strategies on the fund flows and intersections between one or more threat groups or operational echelons in international and retail banking, gaming, MSBs, and digital currency exchanges. Institutions should adopt an “actor-centric” HTF model that targets bad actors with precision, increasing SAR efficacy rates and decreasing false-positive alerts. This concept relies heavily on a typology matrix, which analyzes a bank’s geographic nexus of services, products, and customer base, while cross-referencing identified risks in the global threat landscape. Matches between geography, product line, and high-risk customer profile are tied to specific threats, which leads to the implementation of targeted detection scenarios. Additionally, it is incumbent upon banks to also train their investigations, sanctions, and risk personnel in these new detection scenarios. Sound detection strategies are of little value if the people investigating the behavior lack the requisite knowledge to identify and escalate threat activity. The New York Department of Financial Services (NYDFS) in 2017 implemented new bank transaction monitoring requirements (Part 504) (PDF)(here), which redefined SARs to include the following language: “identifies suspicious or potentially suspicious or illegal activities”. This is in stark contrast to past regulatory language that called for the identification of suspicious “transactions”. Regulators are holding financial institutions responsible for the outcomes of compliance failures, not just their processes. AML units who update their detection logic to a hybrid threat finance model stand to cut costs, reduce risk, improve regulatory relations, and provide improved financial intelligence products to law enforcement, intelligence, and military officials keeping our nation safe. A global money-laundering watchdog has decided to place Pakistan back on its terrorist financing watchlist. Pakistan had launched last-minute efforts to avoid being placed on the list, such as taking over charities linked to a powerful Islamist figure. ISLAMABAD (Reuters) – A global money-laundering watchdog has decided to place Pakistan back on its terrorist financing watchlist, a government official and a diplomat said on Friday, in a likely blow to Pakistan’s economy and its strained relations with the United States. The United States has spent the past week lobbying member countries of the Financial Action Task Force (FATF) to place Pakistan on a so-called grey list of nations that are not doing enough to combat terrorism financing. But the campaign proved insufficient and the group decided late on Thursday that Pakistan would be put back on the watchlist, a senior Pakistani official and a diplomat with knowledge of the latest FATF discussions told Reuters. “The decision was taken yesterday. The chair (of FATF) is expected to make a statement some time this afternoon in Paris,” the diplomat said. Pakistan’s foreign ministry spokesman declined to confirm or deny the news at a regular news briefing on Friday, saying the FATF would make an announcement on its website. “Let the things come out, and then we can comment on the U.S.-Pakistan relationship,” spokesman Mohammad Faisal said. Pakistan was on the list for three years until 2015. He added that the financial consequences would not kick in until June, which, in theory, could allow Pakistan time to fix financing issues. “But the odds of that, particularly in an election year, seem slim,” he added. Pakistani officials and analysts fear being on the FATF list could endanger Pakistan’s handful of remaining banking links to the outside world, causing real financial pain to the economy just as a general election looms. Pakistan has sought to head off its inclusion on the list by amending its anti-terrorism laws and by taking over organizations controlled by Hafiz Saeed, a Pakistan-based Islamist accused by the United States and India of being behind 2008 militant attacks on the Indian city of Mumbai in which 166 people were killed. On Tuesday, Foreign Minister Khawaja Asif tweeted that Pakistan had received a three-month reprieve, adding that it was “grateful to friends who helped”. U.S. President Donald Trump last month ordered big cuts in security aid to Pakistan over what the United States sees as its failure to crack down on militants. Adviser to the Prime Minister on Finance Dr Miftah Ismail informed US Acting Assistant Secretary of State for South and Central Asian Affairs, Ambassador Alice G Wells, about the measures the country was taking to fulfill the requirements of a global body working to curb terrorism financing and money laundering. Wells said that the relationship between the two countries was important and the US would like to carry it forward, according to a handout of the finance ministry. She lauded the reforms that Pakistan has undertaken in different economic spheres and expressed the US support for similar reform efforts in the future, it added. Her statement suggests that the US would like to engage with Islamabad contrary to the intentions recently expressed by US President Donald Trump. “They discuss current state of ties between the two countries, with particular emphasis on the economic cooperation”, the Ministry of Finance stated in the official handout. During the meeting, the adviser informed the US delegation about the actions that Islamabad has taken two weeks ago against proscribed organisations, according to officials privy to meeting discussions. Islamabad has stopped banned outfits from collecting donations aimed at averting a possible action that the Financial Action Task Force (FATF) may propose against the country during its meeting scheduled for next month. The adviser did not raise the issue of outstanding $9 billion that Washington owes to Islamabad on account of the Coalition Support Fund, said the officials. Miftah Ismail said that bilateral visits were helpful in understanding each other’s point of view, according to a statement issued by the finance ministry. The adviser stated that the relations between the two countries have been affected by certain recent developments and it was important to remove the misconceptions, it added. Adviser Finance also welcomed the planned visits of US business delegations and said that people to people contacts were an important part of a bilateral relationship. He expressed his support for business community’s efforts aimed at furthering Pak-US economic ties. Miftah Ismail also briefed the US acting assistant secretary of state about the state of the economy and the measures that his government was taking to correct macroeconomic imbalances on the external front. Ismail said Pakistan has made visible headway in overcoming energy shortages that has given a boost to the country’s productive sectors. This in turn is having a positive impact on the overall economic activities and GDP is growing steadily, he added. US Ambassador David Hale, Finance Secretary Arif Ahmed Khan and other senior officials of the Ministry of Finance were present on the occasion. The U.S. Department of Justice has assembled a team of prosecutors to investigate allegations of drug trafficking and money laundering by the Iranian-backed terrorist group Hezbollah. The allegations were reportedly not pursued by the previous administration because of Iranian sensitivities. The new Hezbollah Financing and Narcoterrorism Team of federal prosecutors will examine all cases stemming from Project Cassandra, an Obama-era Drug Enforcement Administration task force that targeted Hezbollah’s money laundering and drug trafficking in the United States, Attorney General Jeff Sessions announced on Thursday. “The Justice Department will leave no stone unturned in order to eliminate threats to our citizens from terrorist organizations and to stem the tide of the devastating drug crisis,” Sessions said in a statement. Launched in 2008, Project Cassandra revealed that the Lebanon-based Hezbollah was involved in shipping cocaine to the U.S. and laundering money by buying used cars in America and exporting them to Africa. The scheme evolved into a billion-dollar criminal network, Politico Magazine reported last month. But, according to Politico, the Obama White House blocked the DEA’s requests for further investigations and prosecutions while it was negotiating a nuclear deal with Iran. The report led Sessions to order a review of the handling of Project Cassandra. “While I am hopeful that there were no barriers constructed by the last administration to allowing DEA agents to fully bring all appropriate cases under Project Cassandra, this is a significant issue for the protection of Americans,” Sessions said when he ordered the review in December. 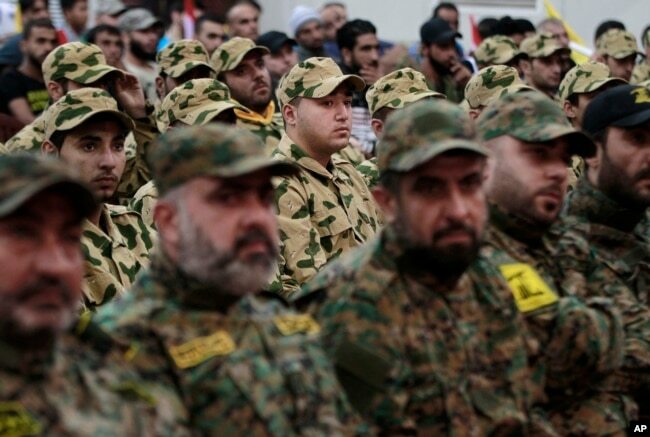 FILE – Hezbollah fighters listen to Hezbollah leader Sheik Hassan Nasrallah, as he speaks via a video link during a rally to mark the Hezbollah martyr day, in Beirut, Lebanon, Nov. 11, 2015. The new team of prosecutors specializing in international narcotics trafficking, terrorism, organized crime, and money laundering will ensure that “all Project Cassandra investigations as well as other related investigations, whether past or present, are given the needed resources and attention to come to their proper resolution,” said the attorney general. The initiative comes as the Trump Administration ratchets up its rhetoric against Iran, accusing it of supporting terrorist organizations such as Hezbollah and fomenting instability in the Middle East. President Trump also faces a Friday deadline to decide if he will continue to suspend sanctions on Iran under the Iran nuclear agreement – a pact he has vowed to end. The president must sign a series of waivers every few months to maintain the suspension of sanctions on Iran and to keep the Joint Comprehensive Plan of Action (JCPOA) deal fully intact. Trump has called the 2015 Iran nuclear agreement “the worst deal ever.” In October, he refused to certify that Iran was in compliance with the agreement, saying it wasn’t in U.S. national security interests. The new team of investigators will be led by Acting Assistant Attorney General John Cronan of the criminal division and will coordinate with investigators from DEA, FBI, Homeland Security and other organizations. The U.S. State Department designated Hezbollah as a terrorist group in 1997.